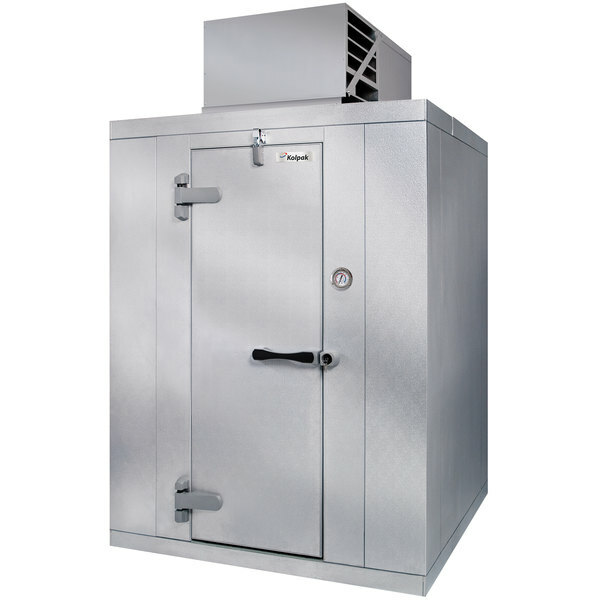 Keep bulk quantities of frozen products at reliably safe temperatures with this Kolpak QS6-054-FT Polar Pak walk-in freezer! The self-contained 1 hp refrigeration system is mounted flush to the ceiling so that you can use 100% of your unit's interior for maximum space-saving efficiency. The system is extremely simple to install and features an automatic condensate evaporator to eliminate the need for a drain line and other plumbing, saving you money on the services of a plumber or refrigeration technician. It uses R-404A refrigerant to maintain a temperature of 10 degrees Fahrenheit. The 26 gauge stucco embossed galvalume steel panels snap together with ease and boast Posi-Loc fasteners to provide you with a perfect airtight fit. Inside the panels is 4" thick CFC-free urethane insulation that not only helps the freezer operate efficiently and maintain consistent temperatures, but also helps give it exceptional structural integrity! A rugged smooth aluminum floor supports evenly distributed loads of up to 700 lb. per sq. ft. so you have the support you need, while coved corners make cleaning a breeze. Workers can easily access the freezer's contents through the 26" wide door that boasts adjustable spring loaded hinges and a durable, ergonomic handle. The door has integrated heater for added protection against condensation, while a safety release is also included inside the unit to prevent accidental entrapment. A 2 1/2" dial thermometer is mounted on the freezer's exterior for simple temperature monitoring, while the interior is illuminated by a vapor-proof interior light for easy product identification. A 120V electrical connection is required for the door heaters, switches, and lights, while a 208/230V electrical connection is required for the refrigeration system.